For other uses, see AVE (disambiguation). Alta Velocidad Española (AVE)[a] is a service of high-speed rail in Spain operated by Renfe, the Spanish national railway company, at speeds of up to 310 km/h (193 mph). Alta Velocidad Española translates to "Spanish High Speed", but the initials are also a play on the word ave, meaning "bird". As of August 2017, the Spanish AVE system is the longest HSR network in Europe with 3,240 km (2,010 mi) and the second longest in the world, after China's. AVE trains run on a network of high-speed rail track owned and managed by ADIF (Administrador de Infraestructuras Ferroviarias), where other high-speed (Avant [es], Alvia) and mid-speed (Altaria) services also operate. The first line was opened in 1992, connecting the cities of Madrid, Córdoba and Seville. Unlike the rest of the Iberian broad gauge network, the AVE uses standard gauge. This permits direct connections to outside Spain through the link to the French network at the Perthus tunnel. AVE trains are operated by RENFE, but private companies may be allowed to operate trains in the future using other brands, in accordance with European Union legislation. Some TGV-derived trains used to run on the broad-gauge network at slower speeds, but these were branded separately as Euromed until new rolling stock was commissioned for these services. Map showing high-speed railway lines currently (January 2018) in operation. Map showing high-speed lines already in operation, under construction or planned (updated January 2018). Towards the end of the 1980s a new line was planned to join the Castilian Meseta with Andalusia without passing through the Despeñaperros Natural Park. After considering various options it was decided that a standard-gauge line, allowing for Spain's first high-speed rail link, would be built. The project was named NAFA (Nuevo Acceso Ferroviario a Andalucía, New Rail Link to Andalusia) and was meant to help revitalise the stagnant southern Spanish economy. The line was inaugurated on 14 April 1992 to coincide with Expo 92 being held in Seville. Seven days later on 21 April 1992 commercial service began with six daily services stopping at Madrid, Seville, Córdoba, Puertollano and Ciudad Real. In October 1992 RENFE began the AVE Lanzadera (Shuttle) service between Madrid and Puertollano and Ciudad Real. It has been suggested that the PSOE government chose the French Alstom bid over the Siemens and Talgo bids for political rather than technical reasons, rewarding the French government for its assistance in capturing ETA activists who took "sanctuary" across the border in southern France. Seville's hosting of the 1992 World's Fair prompted the choice of that city for the inaugural AVE line, with its being the home town of then Spanish president Felipe Gonzalez also playing some role. Seville is the artistic, cultural, and financial capital of southern Spain and the fourth largest city in Spain, after Madrid, Barcelona and Valencia, with a population of over 700,000 and a metropolitan area of almost 1.5 million people. It is also the capital of Andalusia, Spain's most populous autonomous community (region). In January 1993 the Talgo 200 Madrid–Málaga service began, using AVE lines as far as Córdoba and then Spanish-gauge conventional track to reach Málaga. On 23 April that year, the AVE set a new top speed of 356.8 km/h (221.7 mph) on a test run. Later in 1993 the mixed-method services Talgo 200 Madrid–Cádiz and Talgo 200 Madrid–Huelva began. In 1994 AVE trains on the Madrid–Seville line began to run at 300 km/h, cutting journey times by at least 40 minutes and covering the 471 km in 2½ hours, though it is unlikely that much of a saving came from the increase in maximum speed, because only a small section of the line near Los Yébenes has the alignments for 300 km/h operation. The maximum permitted speed is 270 km/h between Atocha station and Brazatortas, save for the approaches to the intermediate stations (Atocha, Ciudad Real and Puertollano). Beyond Brazatortas, the line is only authorised for 250 km/h operation, which drops to 215 km/h in the Sierra Morena mountains and 90 km/h around Córdoba station. It is more likely that time savings occurred as a result of there being fewer intermediate stops. Although in 1999 RENFE began a mixed-service Talgo 200 Madrid–Algeciras route, this was, along with the other mixed services, transferred to Grandes Líneas Renfe (RENFE's Spanish gauge long-distance brand) following changes to plans for high-speed rail in Spain. The last segment of the Madrid–Málaga high-speed rail line was completed on 24 December 2007 when the new high speed railway section between the cities of Córdoba and Málaga was inaugurated. It is a standard gauge railway line of 155 km in length and is designed for speeds of 300 km/h (186 mph). It has compatibility with neighbouring countries' railway systems as well. In October 2015 an extension of the Madrid-Seville high-speed rail line to Cádiz was completed after 14 years of works and put in service by Alvia trains for speeds up to 200 km/h. In 1992, a new high-speed medium distance service (AV Media Distancia operating under the AVE Lanzadera brand) began between Madrid, Ciudad Real and Puertollano, using spare class 100 trains. In November 2003 a new service began between Seville and Córdoba using new class 104 trains, reducing journey times between the two cities to 40 minutes. In 2005 the brand was renamed RENFE Avant, and all services started to use class 104 trains, leaving class 100 for AVE services. The construction of a 21-kilometre (13 mi) stretch of high-speed line from Madrid to Toledo allowed the inauguration of a medium distance service in November 2005. The journey time between the two cities is now less than 30 minutes. The high-speed link combined with high property prices in Madrid has encouraged many Madrid commuters to settle in Ciudad Real, the first stop on the Madrid–Seville line. There has, however, been controversy over the construction of this line as the change to standard-gauge track meant that towns such as Getafe, Aranjuez and Algodor, which now have no commercial services, lost their direct services to Toledo. Furthermore, since Toledo is now connected by standard-gauge track it is impossible for other passenger or goods trains to reach it that have not come from other high-speed lines. Further Avant services have been launched with the expansion of the AVE lines to Valladolid, Barcelona, Málaga and Galicia. See below for details of all Avant services. Class 121 trains based on the Alvia S-120 train-sets are also used for some Avant services. The Madrid–Zaragoza –Barcelona line was inaugurated on 20 February 2008, after parts of the line had operated since 2003 (Madrid–Zaragoza–Lleida) and 2006 (Lleida–Tarragona). This line is currently one of the world's fastest long-distance trains in commercial operation, with non-stop trains covering the 621 km (386 mi) between the two cities in just 2 hours 30 minutes, and those calling at all stations in 3 hours 10 minutes. The line includes a spur railway that branches off at Zaragoza towards Huesca in north Aragon. The Madrid-Huesca high-speed rail line was inaugurated in 2005. The first instalment of a high-speed rail corridor in the north and north-west of Spain was the 179.6 km section Madrid–Segovia–Valladolid which was put in operation on 22 December 2007. It includes a tunnel of 28 kilometres (17 mi) at Guadarrama, which is the fourth longest train tunnel in Europe. The extension of the line with the 162.7 km section Valladolid–Venta de Baños–Leon was inaugurated on 29 September 2015. Valladolid will become the hub for all AVE lines connecting the north and north-west of Spain with the rest of the country. On April 24, 2010, it was announced a 55 km high-speed spur would leave the Madrid–Valladolid route at Segovia and continue to Ávila. Initial plans were expected to be complete by the end of 2010 but as of 2015 this line remains unfinished. 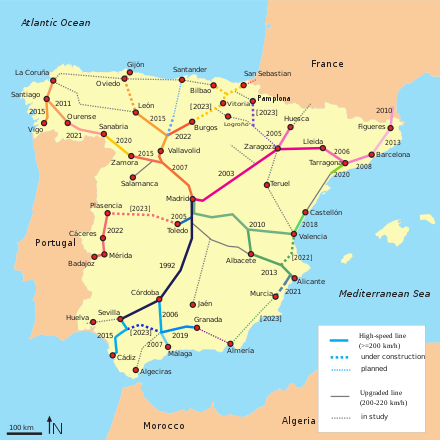 In the north-west of Spain the Madrid–Galicia high-speed rail line is scheduled to be completed in 2019 when the Olmedo–Zamora–Santiago de Compostela part will be connected to the Madrid–Leon line at Olmedo south of Valladolid. The 87.1 km northern section between Ourense and Santiago de Compostela was inaugurated in December 2011 and the 107 km southern section, between Olmedo (130 km north of Madrid on the Madrid–Leon line) and Zamora entered revenue service on 17 December 2015 by Alvia trains. This line will be connected in the region of Galicia with the 156 km Atlantic Axis high-speed rail line that connects the cities of Vigo and A Coruña via Santiago de Compostela. The Atlantic Axis was inaugurated in April 2015 and the section A Coruña–Santiago de Compostela opened in 2009 and was electrified in 2011. The Madrid–Levante network connects Madrid with the Mediterranean coast of the Levante Region (Eastern Spain). The Madrid–Cuenca–Valencia line was officially finished on Friday, 10 Dec 2010, with commercial trips starting on Saturday 18 Dec 2010. Non-stop trains between Madrid and Valencia cover the 391 km (243 mi) in 1 hour 38 minutes. The Madrid–Albacete–Alicante line was inaugurated on 17 June 2013. Trains cover the distance between Madrid and Alicante in 2 hour 12 minutes. On 22 January 2018 the extension section of the line to Castellón was inaugurated introducing a new AVE service Madrid-Castellón which cut the journey time between the two cities by further 30 minutes to total 2 hours and 25 minutes. The AVE service from Madrid to Murcia is expected to be operational by 2020, and work is being prepared to extend the line to Cartagena. When fully operational the Madrid–Levante network will total 955 km of high-speed rail connecting Madrid, Cuenca, Albacete, Valencia, Alicante, Elche, Castellón, Murcia and Cartagena. A milestone for the AVE network was reached in December 2013 when it was connected to the rest of Europe via France. The connecting link was the construction of the 131-kilometre (81.4 mi) Barcelona–Figueres section of the Perpignan–Barcelona high-speed line, an extension of the Madrid–Barcelona line, completed in January 2013 at a cost of €3.7 billion. The international 44.5-kilometre (27.7 mi) Perpignan–Figueres section of the line opened in December 2010 and includes the new 8.3-kilometre (5.2 mi) Perthus Tunnel under the Pyrenees. AVE Madrid–Seville via Ciudad Real, Puertollano, and Córdoba. AVE Madrid–León via Segovia, Valladolid and Palencia. AVE Madrid–Barcelona via Guadalajara, Calatayud, Zaragoza, Lleida and Tarragona. AVE Madrid–Figueres via Guadalajara, Calatayud, Zaragoza, Lleida, Tarragona, Barcelona and Girona. AVE Madrid–Huesca via Guadalajara, Calatayud, Zaragoza and Tardienta. AVE Madrid–Málaga via Ciudad Real, Puertollano, Córdoba, Puente Genil-Herrera and Antequera. AVE Madrid–Valencia via Cuenca and Requena-Utiel. AVE Madrid–Castellón via Cuenca and Valencia. AVE Madrid–Alicante via Cuenca, Albacete and Villena. AVE Barcelona–Seville via Tarragona, Lleida, Zaragoza, Ciudad Real, Puertollano and Córdoba. AVE Barcelona–Málaga via Tarragona, Lleida, Zaragoza, Ciudad Real, Puertollano, Córdoba, Puente Genil-Herrera and Antequera. AVE Valencia–Seville via Cuenca, Ciudad Real, Puertollano and Córdoba. AVANT (mid distance) Madrid–Ciudad Real–Puertollano. AVANT (mid distance) Madrid–Valladolid via Segovia. AVANT (mid distance) Málaga–Córdoba–Seville via Antequera and Puente Genil-Herrera. AVANT (mid distance) Barcelona–Lleida via Tarragona. AVANT (mid distance) Barcelona−Figueres via Girona. AVANT (mid distance) A Coruña–Santiago de Compostela. AVANT (mid distance) A Coruña–Ourense via Santiago de Compostela. AVANT (mid distance) Valencia–Requena Utiel. ALVIA (mixed high-speed/conventional) Madrid–Bilbao, via Valladolid and Burgos. ALVIA (mixed high-speed/conventional) Madrid–Irun, via Valladolid, Burgos, Vitoria-Gasteiz and San Sebastián. ALVIA (mixed high-speed/conventional) Madrid–Gijón, via Valladolid and León. ALVIA (mixed high-speed/conventional) Madrid–Ponferrada, via Valladolid and León. ALVIA (mixed high-speed/conventional) Madrid–Santander, via Valladolid, Palencia and Torrelavega. ALVIA (mixed high-speed/conventional) Madrid–Logroño, via Calatayud. ALVIA (mixed high-speed/conventional) Madrid–Pamplona, via Calatayud. ALVIA (mixed high-speed/conventional) Madrid–Pontevedra, via Segovia, Medina del Campo, Zamora and Ourense. ALVIA (mixed high-speed/conventional) Madrid–Ferrol, via Zamora, Ourense, Santiago de Compostela and A Coruña. ALVIA (mixed high-speed/conventional) Madrid–Cádiz, via Ciudad Real, Córdoba and Sevilla. ALVIA (mixed high-speed/conventional) Madrid–Huelva, via Cordoba. ALVIA (mixed high-speed/conventional) Madrid–Salamanca, via Olmedo and Medina del Campo. ALVIA (mixed high-speed/conventional) Gijón–Castellón, via León, Valladolid, Madrid and Valencia. ALVIA (mixed high-speed/conventional) Gijón–Oropesa del Mar, via León, Valladolid, Madrid, Valencia and Castellón. ALVIA (mixed high-speed/conventional) Alicante–Ferrol, via Madrid, Zamora, Santiago de Compostela and A Coruña. ALVIA (mixed high-speed/conventional) Alicante–Gijón, via Madrid, Valladolid, León and Oviedo. ALVIA (mixed high-speed/conventional) Alicante–Santander, via Madrid, Segovia, Valladolid and Palencia. ALVIA (mixed high-speed/conventional) Barcelona–Irun, via Zaragoza, Pamplona and San Sebastián. ALVIA (mixed high-speed/conventional) Barcelona–Bilbao, via Zaragoza and Logroño. ALVIA (mixed high-speed/conventional) Barcelona–León, via Zaragoza, Pamplona, Vitoria-Gasteiz and Burgos. ALVIA (mixed high-speed/conventional) Barcelona–Gijón, via Zaragoza, Pamplona, Vitoria-Gasteiz, Burgos and León. ALVIA (mixed high-speed/conventional) Barcelona–A Coruña, via Zaragoza, Pamplona, Vitoria-Gasteiz, Burgos, León, Ponferrada and Santiago de Compostela. The central hub of the AVE system is Madrid's Puerta de Atocha, except for the Madrid–León line, which terminates at Chamartín station. All services stop at Girona and Figueres. A Talgo 350 train at Madrid Atocha station. AVE "Alstom" trainset at Córdoba. A RENFE AVE S/103 (Siemens Velaro E) at Figueres Vilafant railway station in 2013. Currently there are five corridors with nine main lines in operation, and two spur lines connecting the cities of Toledo with the Madrid–Seville main line and Huesca with the Madrid–Barcelona main line. Map of the high-speed rail network (newly built and upgraded lines). Also shows under construction, planned or in study lines. The Madrid–Zamora line is the open section of the under construction Madrid–Galicia high-speed rail line connecting Madrid to Zamora via Segovia. The line shares a common section with the Madrid–Leon line for the part between Madrid and Olmedo. The Madrid–Zamora line entered revenue service on 17 December 2015 by Alvia S-730 (Patito, max speed 250 km/h (155 mph)) trains that cover the distance in 1 hour and 33 minutes. Part of the line up to Medina del Campo is also used for the Alvia Madrid–Salamanca service. The Atlantic Axis high-speed railway line is connecting the two main cities of Vigo and A Coruña (Corunna) via Santiago de Compostela in the northwestern Spanish region of Galicia. The railway, 155.6 km in length, is an upgrade of the former non electrified single railway line between the town of Ferrol and the Portuguese border for the part between A Coruña and Vigo, into a double electrified high-speed line. The new rebuilt railway permits mixed use traffic with a maximum design speed of 250 km/h for passenger trains. The new railway was inaugurated in April 2015 and shortened the distance between the two cities by 22 km, from 178 km to 156 km, and cut the travel time from around 3 hours on the old railway down to 1 hour and 20 minutes on the new one. 37 tunnels totalling 59 km and 34 bridges totalling 15 km form part of the rebuilt railway. The line is served by Alvia S-121 or S-730 (max speed 250 km/h (155 mph)) train-sets for the routes between A Coruña and Vigo and between A Coruña and Ourense and by Alvia S-730 (Patito, max speed 250 km/h (155 mph)) train-sets connecting Galicia with other Spanish regions. The line will be connected at Santiago de Compostela with the Madrid–Galicia high-speed rail line, which as of 2015 is under construction. The Madrid–Leon high-speed rail line connects Madrid with León passing the cities of Segovia, Valladolid and Palencia. The line supports the longest railway tunnel in Spain at 28 km in length and is served by up to two S-102 (Pato, max speed 330 km/h or 205 mph) trains per day with the fastest schedule lasting 2 hours and 6 minutes. Other trainsets used on the Madrid–Leon line include S-120 (max speed 250 km/h (155 mph)) and S-130 (Patito, max speed 250 km/h (155 mph)) for the Alvia services. Madrid–Barcelona high-speed railway line connects Madrid with Barcelona in the north east of Spain passing through the cities of Guadalajara, Calatayud, Zaragoza (Saragossa), Lleida (Lérida) and Tarragona where the future Tarragona–Valencia high-speed railway line will connect. The line has a length of 621 km and a travel time of two and a half hours for the direct trains using the route avoiding entering Zaragoza (Saragossa) and Lleida (Lérida). The line is served by S-103 (max speed 350 km/h or 217 mph) trains. Seventeen trains run now every day between 6:00 and 21:00 hrs. Direct trains Barcelona–Seville and Barcelona–Malaga that do not make a stop in Madrid are also scheduled combining the Madrid–Barcelona line with one of the southern corridor's existing lines. S-112 (Pato, max speed 330 km/h or 205 mph) trains are used for these services and cover these distances in less than 6 hours. The international high-speed section across the border, Perpignan–Figueres (44.4 km), of the Perpignan–Barcelona high-speed rail line opened in December 2010. Since then, French TGV trains operate from Paris. The Spanish high-speed section Barcelona–Figueres opened on 7 January 2013. Nine Spanish services initially serviced the line, with 8 being a through service to Madrid, which also connected with two French TGV services from Paris. Previously French TGV services connected Paris and Barcelona by means of a shuttle train on the standard Barcelona–Figueres line. Direct Barcelona-Paris, Madrid-Marseille, Barcelona-Lyon and Barcelona-Toulouse high-speed trains between France and Spain started on December 15, 2013. The Zaragoza–Huesca section branches off from the Madrid–Barcelona line at Zaragoza and connects with the city of Huesca and serves the connection train station for regional trains in the town of Tardienta. The line first put in operation in 2005 and is served by up to two S-102 (Pato, max speed 330 km/h or 205 mph) trains per day with the fastest train journey between the two cities lasting 2 hours and 5 minutes. The Madrid–Castellón line connects the city of Castellón with the city of Madrid passing through the cities of Cuenca, Requena-Utiel and Valencia. The section It is serviced by S-112 (Pato, max speed 330 km/h or 205 mph) trains, assembled by the Talgo-Bombardier consortium. Direct trains to Valencia cover the 391 km in 98 minutes while thirty trains run every day between 05:00 and 21:00, fifteen in each direction. For the service Madrid–Castellón AVE trains cover the distance in 2 hours and 25 minutes and 4 trains per day are scheduled, two in each direction. The line is part of the Madrid–Levante network (see below). Direct trains Valencia–Seville that do not make a stop in Madrid are also scheduled combining the existing lines of Madrid–Castellón and Madrid-Seville. S-102 (Pato, max speed 330 km/h or 205 mph) trains are used for this service and cover the whole distance in 3 hours and 50 minutes. A 350 km/h line branches off from the Madrid–Castellón Line and connects the city of Alicante with the city of Madrid passing through the cities of Cuenca, Albacete and Villena. It is part of the Madrid–Levante HSR network and is serviced by S-112 (Pato, max speed 330 km/h or 205 mph) trains that cover the distance in up to 2 hours and 12 minutes. Direct trains Toledo–Albacete were also scheduled in the past, combining four of the existing lines, but this service was eventually terminated due to low demand. The Madrid–Seville high-speed railway line connects Madrid with Seville in the south of Spain, passing through the cities of Ciudad Real, Puertollano and Córdoba, where the Madrid–Málaga high-speed rail line branches off towards Málaga just outside Los Mochos near Almodóvar del Río. The route travels across the plains of Castile, travelling through the Sierra Morena mountains just before reaching Córdoba, before going onward towards Seville through the largely flat land surrounding the Guadalquivir river. The Madrid–Seville line was the first dedicated passenger high-speed rail line to be built in Spain and was completed in time for Seville's Expo 92. With a length of 472 km, the fastest train journey between the two cities takes 2 hours and 20 minutes. The line is served by S-100 (max speed 300 km/h or 186 mph) trains. The extension section of the Madrid-Seville high-speed rail line to Cádiz is served by Alvia trains that connect the city of Cádiz to Madrid and reach speeds up to 200 km/h in this section. The Madrid–Málaga high-speed rail line connects the city of Málaga with the city of Madrid. The line shares a common section with the Madrid–Seville high-speed rail line up to the city of Córdoba and then includes a 155 km long spur line up to the city of Málaga. It is served by S-102 (Pato, max speed 330 km/h or 205 mph) and S-103 (max speed 350 km/h or 217 mph) trains and the fastest train journey between the two cities takes 2 hours and 20 minutes. Apart from the traffic to and from the city of Málaga, the line also handles the traffic to the cities of Granada and Algeciras. In the future, the line will also support the traffic between Madrid and the Costa del Sol high-speed rail line. The Madrid–Toledo high-speed rail line branches off from the Seville and Málaga routes around the depot at La Sagra. The Avant service between the two cities offers journey times of half an hour on trains with a maximum speed of 250 km/h. Currently there are six corridors with eight lines under construction. Map of the planned high-speed rail network (newly built and upgraded lines). A new interconnecting tunnel is planned between Madrid Atocha and Madrid Chamartín stations. Currently, trains going to Valladolid leave from Chamartín and trains going to Seville, Málaga and Barcelona leave from Atocha station. Also, there is a single daily service in each direction running along the Barcelona–Seville and Barcelona–Málaga routes, which uses the high-speed bypass around Madrid to avoid reversing the direction of train in Atocha station. The tunnel will allow services serving northern cities to travel non-stop or with a stop through Madrid and onward to southern cities (or vice versa), without the driver having to change ends or bypass Madrid, a valuable source of passengers: currently, someone wanting to travel from Valladolid to Málaga, for instance, must travel from Valladolid Campo Grande station to Madrid Chamartín station before taking a Cercanías service to Atocha; then finally taking an onward train to Málaga. On April 24, 2010, tunnelling started on the 7.3 km route connecting Atocha and Chamartin. The tunnel itself is now complete, and the tracks are in place. The electric line is currently being installed, with these works expected to be completed in early 2018, and service started within the same year. The Madrid–Galicia high-speed rail line will connect the city of Madrid with the region of Galicia and the Atlantic Axis high-speed rail line in the North West of Spain via Santiago de Compostela. The line will include a new 424 km long high-speed railway section that starts at Olmedo 130 km to the north of Madrid on the Madrid–Leon high-speed rail line and ends at Santiago de Compostela. Construction on the northernmost part of this section between the cities of Ourense and Santiago de Compostela began late 2004 and this part was inaugurated in December 2011. The southern part between Olmedo and Zamora entered revenue service on 17 December 2015. Constructions on the central part, which crosses some of Spain's most remote and fragile nature areas, are expected be completed in 2019. The line is currently served by Alvia trains. Madrid–Asturias high-speed railway is the line connecting Madrid to the region of Asturias in the north of Spain. The new under construction section branches off the Valladolid–Vitoria high-speed section at Venta de Baños: 205 km north of Madrid and then reaches the cities of Oviedo and Gijón via Palencia and León. This section includes the 24,7 km long Pajares Base Tunnel (Variante de Pajares) which runs under a very mountainous area between the Province of León and the Principality of Asturias. Construction started in 2009 (except variante de pajares which started 2003) and reached León in September 2015 and expected to reach Oviedo and Gijón after 2020. The extension of the Madrid–Valladolid section towards the Basque Country began construction in 2009. This 223.4 kilometres (138.8 mi) railway line will run parallel to the 244.8 kilometres (152.1 mi) long existing railway line. Originally it was to be used as a mixed-use high-speed railway line, but it has since been changed to a passenger-dedicated railway line, leaving the existing railway line for freight trains. The line was forecast to open the Valladolid–Burgos part around 2013 and the Burgos–Vitoria-Gasteiz part in 2014 or 2015. However, due to delays the line is not expected to open before 2023, although the Valladolid–Burgos section is expected to enter full revenue service in 2019. At Vitoria it will be connected to the Basque high-speed railway line (Basque Y), thus reaching the French border. Once opened, the travel time between Valladolid and Vitoria will be around an hour. The Basque high-speed railway line (Basque Y) will connect the three Basque capitals, Vitoria-Gasteiz, Bilbao and San Sebastián. Construction began in October 2006 and the line was forecast to open in 2016. However, due to delays in construction, the line is expected to put in service in 2023 according to the new estimations. The three Basque capitals will be further connected with Madrid via Valladolid, and with the French border via Irun and Bayonne. The Sants–La Sagrera tunnel links the Sants station in Barcelona through the Eixample with the future La Sagrera station. The tunnel passes under the streets of Provença and Mallorca, using a short part of the Diagonal to link between these streets. In the Carrer de Mallorca, the tunnel passes directly in front of Gaudí's masterpiece, the basilica of the Sagrada Família, and in the Carrer de Provença, another Gaudí work, the Casa Milà. In a long campaign against this route, the Board of the Sagrada Família and other parties argued that the tunnel would damage the church, whose construction is still in progress. In this discussion about different routes, the one now built is also called the Provença tunnel because part of its route passes under this street. The tunnel boring machine Barcino passed the Sagrada Família in October 2010, and reached its final destination a few months later. Rail traffic is planned to start in 2012, initially without stops at the La Sagrera station, which is expected to be completed in 2016. In March 2012, railway equipment was installed, with a special elastic isolation of the rails in order to dampen vibrations at the sections passing close to Gaudí's architectural works, using the Edilon system. This is an under construction section, part of the Madrid–Levante network of high-speed railways connecting the capital with the Mediterranean coast. Consisting of 955 kilometres (593 mi) of railways with an estimated cost of 12.5 billion euros, it is the most expensive high-speed railway project in Spain. The network will consist of both dedicated passenger high-speed railways designed for trains running above 300 kilometres per hour (190 mph) and high-speed railways shared with freight trains. The network is to be opened in stages, starting with the Madrid–Valencia/Albacete section, which was opened in December 2010, followed by Albacete–Alicante in June 2013, Valencia–Castellón in January 2018, while Valencia–Alicante is expected to follow in 2019 and finally reaching the city of Murcia by 2020 with a branch line to Cartagena. Transversal Rail Axis (Eje Ferroviario transversal de Andalucía), the Andalusian high-speed rail line connecting Huelva, Seville, Granada and Almería. Part of the line is financed and built by the Andalusian government. The southern Andalusian transverse high-speed railway line is a 503.7-kilometre railway running between the cities of Huelva and Almería, passing the cities of Seville and Granada. The line is designed for speeds up to 250 kilometres per hour, except for the 130-kilometre Antequerra–Granada and the 103-kilometre Seville–Huelva parts of the line, which are designed for speeds in excess of 300 kilometres per hour. A connection between Huelva and the Portuguese border is being studied. When finished the journey between Huelva and Almería in the new line is estimated to last 3 hours and 35 minutes. The first section of the line between Antequera and Granada is expected to put in service by summer 2019 connecting the city of Granada to the rest of the high speed network via the Madrid–Málaga high-speed rail line. The section between Seville and Antequera is expected to be completed in 2020. This high-speed railway line will be part passenger-dedicated high-speed railway (Madrid–Alcázar de San Juan) and part shared with freight trains (Alcázar de San Juan–Jaén). The first 99 km of the line will use the already existing Madrid-Seville high-speed railway line. From there, a 67.5 km branch line will be constructed towards Alcázar de San Juan. From Alcázar de San Juan the existing railway line will be upgraded to allow passenger trains to run up to 250 km/h; a new double-tracked route through the Despeñaperros mountain range will be built to replace the existing single-tracked route. This part of the high-speed railway also forms part of the Madrid–Algeciras freight corridor. An extension of the line to Granada is being investigated; however, the complicated terrain between Jaén and Granada might make it uneconomical. The high-speed Barcelona-Figueres section (from Barcelona to the French border) was inaugurated in January 2013. The journey from the centre of Barcelona to the centre of Girona takes now 37 minutes (compared to the hour and a half it took), and to Figueres in 53 minutes (instead of two hours). Girona and Figueres will be 14 minutes from each other. The Perpignan (France)-Figueres section opened in 2010. One lacking high-speed section on the French side, between Montpellier and Nîmes, is scheduled to open in July 2018, allowing almost continuous high-speed travel from the French high-speed network to the Spanish one. The French government, on the other hand, recently announced indefinite delays to the Montpellier-Perpignan high speed section that was originally planned for 2020. The section linking Tarragona to Almería via Valencia and Murcia is expected to be completed by 2023. The final section between Almería and Algeciras, passing through Málaga, will be built at a later point of time and an alternative and longer route looks likely. This line was initially planned as Lisbon–Madrid high-speed rail line in order to connect the two peninsular capitals, Madrid and Lisbon in 2 hours and 45 minutes. This line had been a key issue in bilateral summits in recent years and was about to link Spain’s high-speed rail network with the planned High-speed rail in Portugal, a project announced by the Portuguese government in February 2009. Construction on the Spanish side began in late 2008 on a segment between the cities of Badajoz and Mérida. Both Spanish and Portuguese track were to be completed around 2013, later the Portuguese government brought forward its plans from 2015 but the Portuguese froze works in June 2011 and eventually cancelled the project in March 2012. In 2016 the European Union's European Regional Development Fund, gave Spain €205.1m towards the €312.1m needed for the track between Navalmoral de la Mata and Mérida, Spain. The section on the Spanish side between Madrid and Badajoz is expected to be completed in 2023. With a length of 439 km on the Spanish side, of which 48 km are part of the already built Madrid–Seville high-speed rail line, it will connect cities like Talavera de la Reina, Navalmoral de la Mata, Plasencia, Cáceres, Mérida and Badajoz. The Almonte River Viaduct was completed in May 2016 to carry this line. It is a concrete arch bridge with a span of 384 meters (1,260 feet), ranking among the longest in the world of this type of bridge. In the short term, other connections to the LGV are planned. After the connection to France at La Jonquera in Catalonia, another connection is proposed at Irun in the Basque Country. Other new lines are under consideration, including a line connecting Soria to the Madrid–Barcelona line at Calatayud. Finally, the Madrid–Barcelona line currently terminates in Barcelona's Estació de Sants, but a new station is under construction at La Sagrera on the northern edge of the city. In the long term, the Spanish government has an ambitious plan to make 7,000 kilometres (4,300 mi) of high-speed railway operational, with all provincial capitals at most only 4 hours from Madrid, and 6½ hours from Barcelona. According to the Strategic Plan for railway infrastructures developed by the Spanish Ministerio de Fomento (Ministry of Public Works), called PEIT, and published in 2005, a second expansion program is planned to start when the last lines of the first program still under construction begin operation. This plan initially had a ten-year scope, ending in 2020, and its ambition was to make the 300 km/h (186 mph) network reach 10,000 kilometres (6,200 mi) by the end of that year. However, this program has been now postponed to indefinite time frame since the first expansion program is still on going. When both programs will be completed, the Spanish high-speed network will be the most extensive network in Europe, with several operational links with France and Portugal, and this is the most ambitious high-speed rail plan in the European Union. The 430 km high-speed line will connect Ferrol in Galicia with Bilbao in the Basque Country passing through the regions of Asturias and Cantabria along the Cantabrian Sea coast in the north Spain. The line will be further connected to the Atlantic Axis high-speed rail line on the west, the Basque Y high-speed railway line on the east and the north corridor (future Madrid-Gijón high-speed railway line) in Asturias region. The travel time between El Ferrol and Bilbao in the new line is estimated to last 1 hour and 48 minutes. The line is not yet projected but it is planned to be completed before 2024. The line will connect the Valencian Community with the Basque Country region and the French border passing through the regions of Aragon, Navarre and La Rioja, with further connection to the TGV network via Irun towards Bordeaux and Paris. The line will include two connections between the region of Aragon and the Basque Country, one via Pamplona in Navarre towards the French border and one via Logroño in La Rioja towards Bilbao. Connected cities will include Valencia, Teruel, Zaragoza, Pamplona, Logroño, Vitoria-Gasteiz, San Sebastián and Bilbao with possible further connection to Santander. The travel time between Valencia and Bilbao in the new high-speed line will be decreased from 9 hours down to roughly 4 hours. The line is not yet projected. A new high-capacity rail connecting Spain with France on international standard gauge track is considered via a 40 km tunnel through the central Pyrenees mountains. The line, also called Trans-Pyrenean Central Corridor (Travesía Central de los Pirineos) or TCP project, will serve both passenger high-speed trains as well as large freight trains and will connect directly Zaragoza to Toulouse via Huesca a distance of 355 km in length. Ten possible alternatives are being considered for crossing the mountains, all of them including tunnels at low altitude and other possible stops include Tarbes or Pau. There is currently no clear provision on its construction. A new high-speed line is planned to branch off from the current Madrid–Leon high-speed rail line at Palencia and as a part of the north corridor will connect the region of Cantabria to the high-speed rail network with direct connection to Madrid. According to the plans the city of Santander will be connected via Villaprovedo and Reinosa. An agreement for completing the line by the end of 2015 was signed on 11 August 2010 including the agreement to call tenders for the section between Palencia and Villaprovedo before the end of March 2011 and for the Villaprovedo – Reinosa section before the end of 2012. However the line still remains unprojected. The still growing network transported a record 17.5 million passengers in 2015, counted twice (entry and exit). Though the network length is extensive, it lags in ridership behind comparable high-speed rail systems in Japan, France, Germany, China, Taiwan, and Korea. ^ a b "Infraestructuras y Estaciones. Líneas de Alta Velocidad". ADIF. ^ "Madrid — Barcelona at 310 km/h with ETCS Level 2". Railway Gazette International. London. 18 October 2011. Retrieved 9 November 2011. ^ "Adif - Líneas de alta velocidad". www.adifaltavelocidad.es (in Spanish). Retrieved 2017-08-17. ^ "High speed line opens to Alacant". Railway Gazette International. 18 June 2013. ^ "Rafa Sánchez, concejal del PSOE: "Gerardo Velasco es un mal educado" - interview with Rafa Sánchez". Diario La Torre (in Spanish). Málaga. 10 August 2007. Retrieved 17 October 2008. ^ Iñaki Egaña (1992). Los días de Argel: crónica de las conversaciones ETA-Gobierno español. Txalaparta. pp. 32–33. ^ a b "Fomento culmina la obra de alta velocidad entre Sevilla y Cádiz". lavozdigital.es (in Spanish). ^ "Our Trains". www.renfe.com. Retrieved 2018-07-25. ^ It is planned that in 2012 high-speed services will link Madrid and Barcelona with Paris-Gare de Lyon and later perhaps London St Pancras (using the Eurotunnel and the HS1 line). "High-Speed Train To Link Madrid, Barcelona | Travel News from Fodor's Travel Guides". www.fodors.com. Retrieved 28 January 2009. ^ a b DVV Media UK. "Boring begins beneath Madrid". Railway Gazette. ^ "Los AVE de pruebas entre Olmedo y Zamora comenzarán a circular a finales de septiembre". La Opinión de Zamora. 23 August 2015. Retrieved 19 November 2015. ^ "Ourense - A Coruña broad gauge high speed line opens". Railway Gazette International. 23 December 2011. Retrieved 19 November 2015. ^ a b c Fran Hurtado (15 December 2015). "El AVE Madrid-Zamora se estrena este jueves sin actos inaugurales". noticias.lainformacion.com. Retrieved 23 December 2015. ^ Fernando Puente (20 April 2015). "Spain inaugurates Galicia high-speed line". International Railway Journal. Retrieved 19 November 2015. ^ a b Europa Press (10 December 2010). "Diplomáticos y periodistas extranjeros conocen el AVE a Valencia en un viaje de simulación". europapress.es. ^ "King Juan Carlos and Queen Sofía open the AVE high speed train line between Madrid and Valencia". Typically Spanish. Malaga. 19 December 2010. Archived from the original on 2010-12-23. Retrieved 19 December 2010. ^ a b Pablo García (22 January 2018). "Una avería para en Sagunto el AVE Madrid-Castellón en su estreno con Rajoy a bordo". El Independiente. ^ a b JANDRO ROURES (17 January 2018). "Rajoy inaugurará el lunes el AVE Castellón-Madrid que empezará a circular el martes con 4 trenes diarios". elmundo.es. ^ a b "Líneas de alta velocidad, Línea Madrid - Castilla La Mancha - Comunidad Valenciana - Región de Murcia". ADIF. Retrieved 26 January 2018. 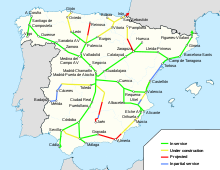 ^ "High speed lines Madrid — Castilla La Mancha — Valencian Community — Region of Murcia line". ADIF. Archived from the original on 2010-09-23. Retrieved 24 September 2010. ^ "High speed services between France and Spain launched". Railway Gazette. 2013-12-17. Retrieved 2014-04-11. ^ "Paris-Barcelona TGVs set for December 15 launch". International Railway Journal. 2013-11-28. Retrieved 2014-04-11. 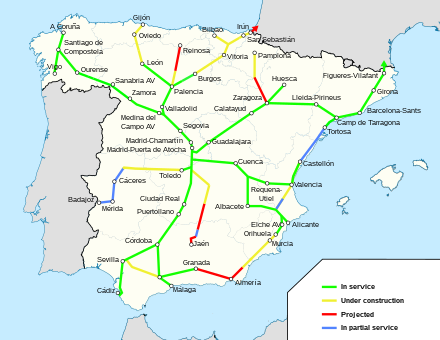 ^ "Spain completes Iberia's high-speed link to Europe". International Railway Journal. 2013-01-08. Retrieved 2014-04-11. ^ "High speed line opens between Barcelona and Figueres". Railway Gazette. 2013-01-08. Retrieved 2014-04-11. ^ "Barcelona-Figueres HS line to open January 7". International Railway Journal. 2012-12-12. Retrieved 2014-04-11. ^ "Perpignan–Figueres link inaugurated". Railway Gazette. 2011-01-27. Retrieved 2014-04-11. ^ "Infraestructuras y Estaciones. Líneas de Alta Velocidad". Adif. ^ "Fase final de las obras del Eje Atlántico y de la nueva estación de Vigo-Urzáiz". fomento.gob.es. 30 March 2015. Retrieved 20 November 2015. ^ C. Prego (15 April 2015). "Renfe estrena el Eje Atlántico el sábado con una rebaja del 50% en las tarifas". La Opinion A Coruña. Retrieved 23 November 2015. ^ DVV Media UK. "High speed line opens between Barcelona and Figueres". Railway Gazette. ^ Fernando Puente. "Barcelona - Figueres HS line to open January 7". railjournal.com. ^ "AVE rail connection between Barcelona and Paris to open in December". thinkspain.com. ^ "Los Reyes inaugurarán el AVE a Valencia, y los Príncipes la conexión a Albacete". Europa Press (in Spanish). 10 December 2010. Archived from the original on 10 April 2014. ^ "Rajoy destaca que el AVE llegará a Burgos este año y el tramo a Vitoria estará en 2019". diariodeburgos.es (in Spanish). 17 May 2015. ^ "Las obras del tramo Grañena-Jaén de la Línea de Alta Velocidad se reanudan y se espera que acaben a final de 2018". ^ Pozo, Raúl (23 August 2017). "Infraestructuras - El AVE a Extremadura se eterniza: Fomento encarga ahora el estudio para el tramo Madrid-Cáceres". Vozpópuli. ^ "Fomento presenta obras para agilizar en Madrid tráfico de AVE a la Comunitat". La Vanguardia (in Spanish). Retrieved 2017-08-24. ^ "High speed lines Madrid-Galicia line Zamora-Lubián–Ourense and Ourense-Santiago". ADIF. Archived from the original on 23 September 2010. Retrieved 24 September 2010. ^ "High-Speed Lines León — Palencia Line". ADIF. Archived from the original on 23 September 2010. Retrieved 24 September 2010. ^ "High Speed Lines Leon — Asturias high speed line". ADIF. Archived from the original on 2010-09-23. Retrieved 24 September 2010. ^ "New AVE high speed train service to Palencia and Leon opens". ADIF. 29 September 2015. Retrieved 1 October 2015. ^ "High-Speed Lines Valladolid — Burgos — Vitoria Line". ADIF. Archived from the original on 2010-09-23. Retrieved 24 September 2010. ^ "High Speed Lines Vitoria — Bilbao — San Sebastián Line". ADIF. Archived from the original on 23 September 2010. Retrieved 24 September 2010. ^ Comorera, Ramon (12 March 2012). "Doble aislante de vibraciones en las obras de Gaudí" [Double Isolation of Vibrations at the Gaudí constructions]. El Periódico de Catalunya (in Spanish). Retrieved 12 March 2012. ^ "Railway Gazette: Madrid — Valencia high speed line opening dates confirmed". Retrieved 2010-10-16. ^ "The new HSL between Albacete and Alicante opened on June the 18th (translation)" (PDF). formento.es (in Spanish). ^ "High-speed Lines Antequera — Granada". ADIF. Archived from the original on 23 September 2010. Retrieved 24 September 2010. ^ "3 horas y 35 minutos de Huelva a Almería". juntadeandalucia.es. 22 January 2010. Retrieved 13 January 2016. ^ "Nîmes – Montpellier bypass carries first freight". Railway Gazette International. 13 December 2017. ^ "The Mediterranean Rail Corridor will be a reality in 2020". Catalan news agency. 17 March 2011. Retrieved 30 October 2015. ^ a b "High Speed Lines Madrid — Extremadura — Portuguese Border line". ADIF. Archived from the original on 23 September 2010. Retrieved 24 September 2010. ^ "Alta Velocidade em Síntese" (in Portuguese). Rave.pt. Archived from the original on 2010-10-04. Retrieved 24 September 2010. ^ "Pointers December 2009". Railway Gazette International. London. 6 December 2009. Retrieved 24 September 2010. ^ "Portugal's cutbacks halt high-speed train to Spain". The Guardian. London. 5 July 2011. Retrieved 27 October 2011. ^ "High speed programme axed". Railwaygazette.com. Retrieved 2015-11-11. ^ "ESI funds to improve Madrid – Lisboa connection". Retrieved 2017-04-14. ^ "Almonte River Viaduct". . Structurae. ^ Arribas, David. Closing the Mouth. Roads & Bridges, Arlington Heights, Illinois. September 6, 2016. ^ "Strategic Infrastructures and Transport Plan (PEIT)". Archived from the original on 2010-06-26. Retrieved 2010-08-25. ^ "El AVE del Cantábrico unirá Ferrol y Bilbao en menos de dos horas". La voz de Galicia. 2003-01-25. Retrieved 2015-10-29. ^ Ramón Muñiz (2015-05-29). "Pastor aprueba el plan de infraestructuras que promete un AVE por la costa antes de 2024". GIJÓN: elcomercio.es. Retrieved 2015-10-29. ^ "El AVE unirá en cuatro horas el Cantábrico y el Mediterráneo". El País. 2009-11-04. Retrieved 2015-10-29. ^ "Catalans shocked by decision to prioritise the Central Railway Corridor". Catalan news agency. 17 February 2012. Retrieved 30 October 2015. ^ Dr. Jaap Vleugel (October 2006). "Natural cross-border barriers to the development of Trans-European Transport Networks" (PDF) (Press release). Brussels: EUROPEAN UNION Committee of the Regions. Delft University of Technology. Retrieved 2015-11-02. ^ "Trans-Pyrenean Central Corridor, Spain - France". Environmental Justice Atlas. 26 January 2015. Retrieved 30 October 2015. ^ "High speed concession plan". Railwaygazette.com. 25 August 2010. Retrieved 16 November 2015. ^ Sevillano, Elena G. (22 May 2016). "Una de cada cuatro estaciones de AVE tiene menos de 100 pasajeros al día" – via elpais.com. Wikimedia Commons has media related to High speed railway lines in Spain.